Bed and breakfast in Ripon. The market town of Ripon, North Yorkshire, is one of England's smallest cities. It has a magnificent Cathedral, historic buildings, a thriving market every Thursday, swimming baths, a meandering of medieval streets dotted with tearooms and arts and crafts shops. There are some unusual museums in Ripon including The Prison & Police Museum, St Marygate, The Workhouse Museum, Allhallowgate and The Courthouse Museum, Minster Road. The cathedral, originally a Minster until 1836, is as spectacular in its way to York Minster. From April to August Ripon Racecourse is open for visits, or you can choose from spa gardens, the restored canal basin or the Wetlands nature reserve. Ripon is an ideal place to stay when visiting the many attractions of the surrounding towns, villages and areas of outstanding natural beauty in North Yorkshire. Also see Ripon & Ripon attractions. 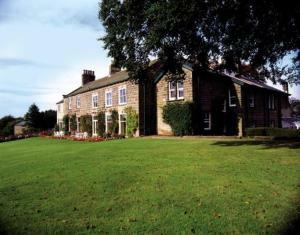 For bed and breakfast accommodation in other areas near to Ripon Yorkshire see bed and breakfast in Thirsk bed and breakfast in Wetherby. Also see Ripon hotels. Only five minutes level walking distance from the centre of the ancient city of Ripon. Offering good Yorkshire food, real ale, log fires and traditional hospitality, the Ripon Spa Hotel is within easy walking distance of Ripon city centre, 20 minutes from Harrogate. Guests can relax and enjoy the comfort of the attractive public areas, overlooking the beauty of the gardens in the changing seasons. Best Western Ripon Spa Hotel is just a 5-minute walk away from the main market square and cathedral, located by the spa gardens and public swimming pool. Hotel near Ripon. 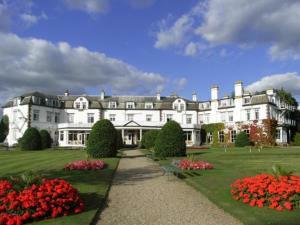 Aldwark Manor is a beautiful Victorian Manor House, set in parkland, ideally located close to the historic City of York. Accommodation offered varies from a traditional style in the Manor House, to contemporary bedrooms in the new extension. The hotel has been awarded 2 AA Rosettes for its restaurant, the ideal place to relax after sightseeing in York, Harrogate and the surrounding areas. The lounges also boast a terrace patio overlooking the gardens and golf course..
Georgian village house in between York and Thirsk. We offer two double en suite rooms in this village on the Swale (with fishing) and on Sustrans cycle route 65. 4 pubs in the village all within 300 yards.